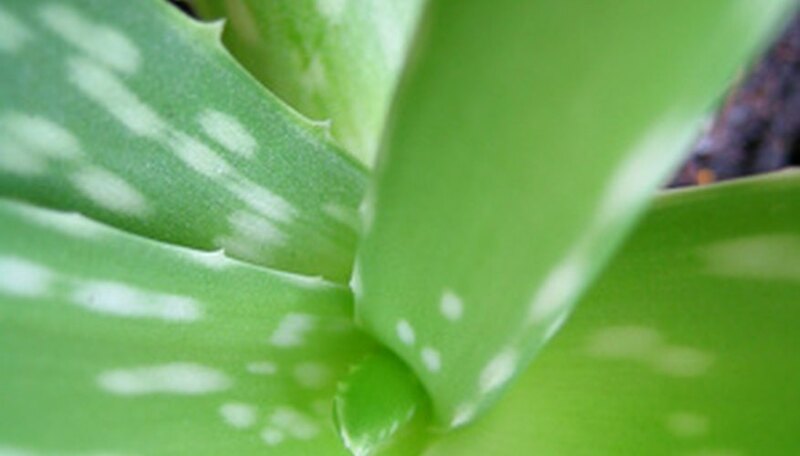 The hardy, low-maintenance aloe vera has long been popular due to the gel inside, which is commonly used as a healing salve. Though aloe plants are easy to care for, overwatering can be a killer. They prefer slightly dry conditions and well-drained soil. When soil drains too poorly for aloe vera, it can be fixed by mixing in soil particles that help the soil drain more efficiently. Aloe vera is a succulent with long, spiny leaves thicker at the base than at the top. Generally green with an occasional stalk bearing yellow flowers, aloe vera is prized in many places for its healing properties. The leaves grow out from the base in a cluster and are filled with a bitter gel that oozes out when a cut leaf is squeezed. Aloe vera is thought to come from the Mediterranean, according to the Union County College Guide to Aloe Vera. According to Purdue Horticulture, however, the plant may be a native of Africa. A valuable medicinal crop, aloe is cultivated for sale all over the world, particularly in India and Africa. A particularly tough plant, aloe vera can survive in almost any soil, as long as it stays fairly dry. Aloe vera cannot grow in constantly wet soil. When aloe is planted outdoors in moist climates, providing the aloe vera with a bed of well-drained, rocky, sandy soil will increase its survival. Adjust watering schedules, depending on the climate and the type of soil. The aloe plant will tolerate some water retention if it is not overwatered. Aloe vera can withstand drought and dry soil. Allowing aloe vera soil to dry out between waterings helps prevent diseases, including bacteria and fungi that thrive in wet conditions. Soil that drains too slowly will not sustain an aloe plant. Amend by adding large soil particles, sand and silt. Soil heavy in clay tends to retain water, creating a wet soil environment unsuitable for aloe vera. Store-bought mineral soil additives that improve soil drainage include perlite and vermiculite. Aloe vera thrives when planted in a pot in a sunny window. Because this plant grows heavy leaves in an upward direction, it can have a tendency to topple if planted in a light pot in lightweight soil. Adding sand instead of perlite as a means of increasing potting soil drainage can help increase the weight of the soil at the bottom of the pot and decrease its chances of toppling. All pots used to plant aloe need a fairly large drainage hole in addition to well-drained soil.